Home | Real Estate Professionals Inc.
Real Estate Professionals Inc. is a locally-owned, independent company comprised of good people helping good people buy or sell Calgary real estate. Professional. Responsive. Knowledgeable. That’s what you can count on when you Go with the Pros. You will rest easy knowing your best interests are being cared for. You will rest easy knowing you have an expert at your side. When it comes to your success, we never rest. We look forward to serving you. 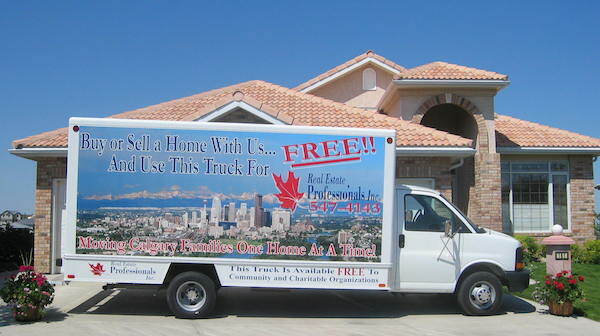 Buy or sell a home with us and use this truck for FREE. This truck is also available FREE to community and charitable organizations. Browse our Open Houses and find the property that's right for you! Interested? Get In Touch Today! Buy or Sell with Real Estate Professionals Inc. Today!